Have you ever noticed how BUSY things tend to get once the Spring season hits? 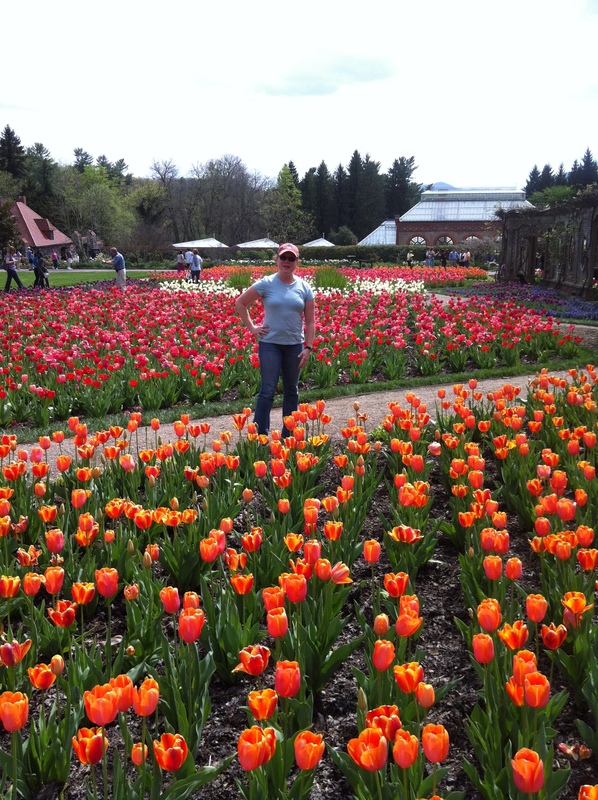 I don’t know about you, but between Spring Break, all the end-of-the-year school events for my daughters, getting the yard prepped for summer, getting in time for yoga, and then trying to find time to enjoy the beautiful weather…well, it’s HARD! And if I don’t watch myself, it brings on super amounts of stress. Isn’t this supposed to be the time of year where we should be having fun, enjoying life and all that nature has to offer? Well, this Spring, I plan on really sticking to my guns about keeping my stress levels in check and enjoying my friends and family. My goal is to make it through my older daughter’s high school graduation, my younger daughter’s elementary school graduation, a business trip and several other things without losing my cool and jeopardizing my health. Oh, and by the way, I plan on having FUN through all of this…going on the lake with my family, walking the trails of our Greenway, making the time for MY yoga practice. Yep, that’s what I’m gonna do. Because Spring can be so busy for so many people, it’s a good idea to balance its energy by incorporating lots of grounding poses into your yoga practice, spending lots of time focusing on the feet and making sure your foundation is solid. Poses like Mountain, Warrior 2, Tree, Bridge, Grounded Warrior 3, and many others are wonderful poses to weave in. We’ll be focusing on this grounding theme throughout the month of May. This week, we’ll be paying particular attention to the feet. The feet are the start of a proper foundation, so what better place to begin? It’s important to have proper alignment and balance in the feet because this affects the joints above (ankles, knees and hips) and all the associated muscles. Mountain Pose is the perfect place to dig in and start figuring out the tendencies of our feet. For example, are you someone whose feet over-supinate (placing more weight on the outer edges of your feet) or over-pronate (placing more weight on the inside edges of your feet)? We will play with the extremes of each, and then work towards finding the balance between the two. When our foundation is solid and stable, we are more likely to find the strength and the spirit to accomplish something meaningful, both on and off the mat. First of all, apologies for not posting a blog last week. But for the first time ever, my husband and I took our girls on vacation for Spring Break for the WHOLE WEEK! Yep, you heard that right. We’ve never done that before…maybe a long weekend here and there, but never a whole week. We have family who lives in the Florida Keys and she graciously offered to let us stay with her and her husband so that we wouldn’t have to pay the exorbitant hotel prices, so how could we refuse? So we rented a very nice mini-van, equipped with a DVD player, satellite radio and leather seats, and we drove on down. 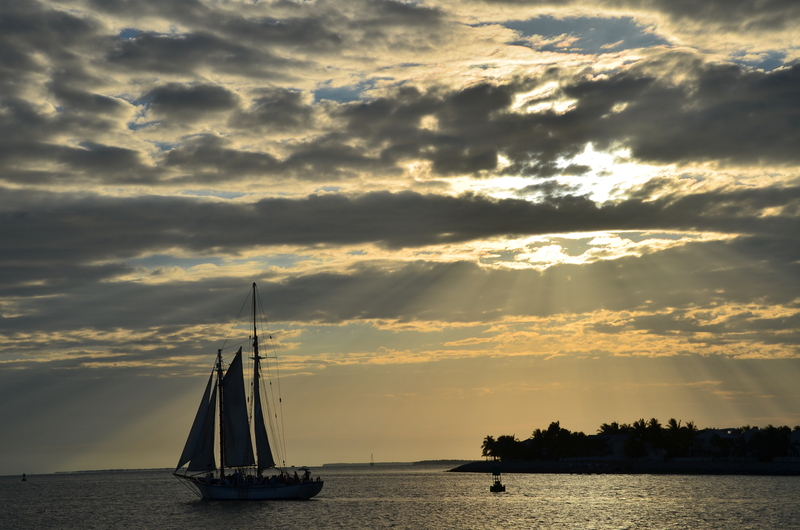 You know, they say when you’re in the Keys, you’re on 3/4 time. Everything just moves at a slower pace there, and everyone is so laid back. So I vowed to be like that while I was there…to relax and enjoy things, not worry so much about everything. That is asking a lot of myself, as many of you who know me can probably guess. I mean, I am always worrying about SOMETHING, even when it’s something silly and stupid. But I did it. I totally and utterly enjoyed myself while we were there. I slept in, I didn’t plan out every last detail and instead just waited until I woke up to see what everyone felt like doing and that’s what we did. Since I couldn’t find a yoga studio that I could get to, the islands were my yoga mat. I meditated on the edge of the water at the house we stayed at, and while watching the sunset each night. I stretched my body while overlooking the island waters. I practiced my breathing while smelling the wonderful salt air and feeling the island breezes wash over me. It was amazing. I feel like I left the islands a little more “present”. A little more aware of all the beauty around me wherever I go and whatever I do. Watching how the locals in the Keys live, how they appreciate their lives and everything around them, has seeped into me a little. My goal now, as I settle back into my “real life”, is to see if I can maintain this happiness I am feeling. Life is too short, and the quote above by the Buddha says it wonderfully…this world is fleeting, so we better regard it as such, appreciating all that it has to offer NOW…not LATER. It’s no secret to those of you who know me that I absolutely LOVE zombie movies. I am a HUGE fan of “The Walking Dead” TV show, and all the latest zombie movies that have come out the last few years ( “28 Days”, “28 Days Later”, “Legend”, “World War Z”…to name a few). I’ve even read the first 9 years of “The Walking Dead” comics. Yeah, I am a zombie geek, I’ll admit it. Right about now, you’re probably wondering why in the world I am talking about zombies. This is a yoga blog, right? 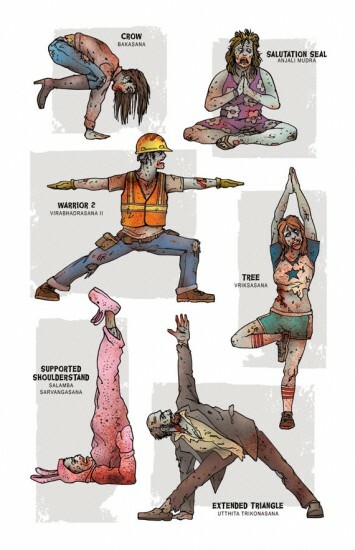 YOGA CAN PREPARE US FOR THE ZOMBIE APOCALYPSE. Yes! You read that correctly. Hear me out, as I promise I haven’t lost my mind. OK. OK. I’m choosing to focus on the Zombie Apocalypse because I wanted to grab your attention a bit, and it’s fresh on my mind from all the zombie things I’ve been watching and reading. But really, what I am about to share is applicable to any tough situation we’re faced with. Maybe it’s an illness, a divorce, losing a loved one…anything you’re faced with that seems insurmountable, yoga can help. I promise. In yoga, we learn about how important breathing is in each and every class. As a teacher, I mention it over and over again throughout each class because it’s THAT important! We don’t realize how shallowly we typically breathe, and when we breathe in this way, it causes more stress. Learn to breathe deeply, and you’ll notice you are more focused, energetic and calm. On the mat, this is especially helpful when we’re working on challenging poses and sequences. In the Zombie Apocalypse (or any other tough situation you’re faced with), this is also super important, wouldn’t you say? With focus, you’ll be able to face all the obstacles in your way more successfully. With energy, you’ll be able to push through until the danger has passed. And with calmness, you’ll be able to deal with things more rationally and realistically. And let’s face it…if you’re breathing shallowly, gasping for air, the zombies will hear you and come running. We don’t want that, do we? In yoga, you might be on the mat next to little Miss Gumby, who can get into every single pose without even trying. But if you’re not also a little Miss Gumby, then you’re going to get frustrated or hurt yourself if you try to do the same thing on your own mat. You need to do what’s right for YOUR body, and try to learn and grow in the ways that are best for YOU. In the Zombie Apocalypse (or any other tough situation you’re faced with), you need to know where you excel and where you don’t. After all, if you can’t hit a target to save your life, then you’re PROBABLY not the right person to have on guard duty, right? Maybe you’d be better off looking for food, tending to the wounded, or something like that. The point is this: figure out who you are and what you’re good at. Then do the things you need to in order to grow in those areas. In yoga, I’ve had many teachers over the years say that in order to get stronger in our practice, we need to find the “edge” in our poses…that point where we go just beyond our comfort zone but not the point of pain. Usually, this is said when attempting the particularly challenging poses. When we can feel the muscles burning, we know we’re getting stronger and making progress. In the Zombie Apocalypse (or any other tough situation you’re faced with), this concept also holds true. I mean, let’s face it. If there is a herd of zombies running after me, I’d say that is a bit outside of my comfort zone. Wouldn’t you agree? Seriously, though. There are many things that will happen in our lives that will throw us for a loop. No matter how hard we try to keep things drama-free and “safe”, there will always be something unexpected. It’s the nature of life. But if we can tap into our inner strength when we are challenged with something big, the lessons we will learn can be life-changing. In yoga, I usually talk about letting go of stress, negative thoughts, competition and expectations at the beginning and/or end of class. It’s important to let go of these things because they can hold you back on the mat. How can you expect to get to the next level of a particularly challenging pose if you keep telling yourself that you can’t do it? Make the choice to let go of the things that hold you back, and you’ll be amazed at how your practice will evolve. In the Zombie Apocalypse (or any other tough situation you’re faced with), you’ll make better decisions if you can let go of these negative things because you’ll have more clarity. You’ll be able to look at the bright side of things (like the fact that you’re here for one more day). And when you can do that, it’s easier to find viable solutions to the problems you’re faced with. In yoga, I’m always telling my students to let go of whatever they came into the room with and not to worry about what’s waiting for them after class. There is only the present, the RIGHT NOW. On the mat, if you keep thinking about what you used to be able to do, or if you’re focusing too much on where you WANT to end up in a pose, you’re less likely to achieve anything at all. Why? Because you’re not focused at all on what your body, mind and breath are doing in the moment. When I’m not focused on what I’m doing, that’s when I usually end up losing my balance and toppling over. In the Zombie Apocalypse (or any other tough situation we’re faced with), it’s even more important to focus on the RIGHT NOW. Why bother focusing on the past or the future? We can’t change what’s already happened or get back the things we’ve lost, so there’s no point in dwelling on it and wondering what might’ve been. We can’t control the future either, because anything can change at a moment’s notice. I mean, look at the zombies themselves. Do you see them strategizing their next move? No! They’re just moving from one thing to the next, as it meets their fancy, without a care in the world of what’s gonna happen next. Now there’s a lesson for us, right there! So there you have it! My top 5 list of how yoga can prepare us for the Zombie Apocalypse (or any other tough situation you’re faced with). Now you can rest easy that when the Zombie Apocalypse (or any other tough situation you’re faced with) arrives, you’ll be prepared. You’ll be able to handle it. And you WILL survive.